By Ken Bird, W8SMK When I was a kid in Junior High School I had a paper route. I remember a time when I saw an old guy on N. Washington St. building a fold-over tower in his yard. I asked him what it was for. He said “I’ll show you.” He took me into his single car garage where there were line-ups of old military gear down both sides. Turns out he was Harold “Hump” Eagon, W8???. He said he was a MARS operator. At the time I didn’t know what that meant. Fast forward several years. When I got home from the U.S. Army in 1971 I found something called CB Radio, and soon thereafter I ran into Bob Scott, WB8JEY on the air. It didn’t take long for him to convince me to get my Amateur license and I was hooked. Through Bobby I met several of his very knowledgeable Ham friends. It also turns out that back in the late 50s or 60s there was a radio club in Delaware. I think it was called the Delaware Radio Club. They also had a club call sign of W8QLS. If you have seen the first edition of the DELARA News, the roster contains many of those names from the past (only a couple of us left), and we were able to transfer that call sign to the new club. Well, fast forward again to about 1979. 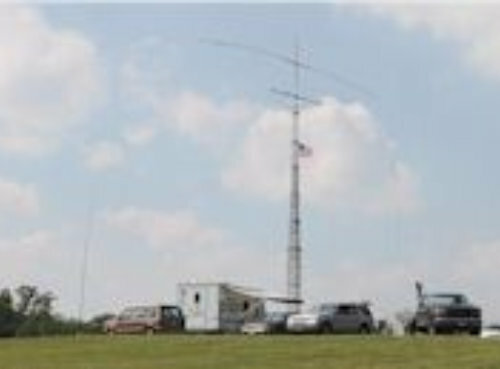 Many of us (mostly knowing each other from 2M) decided that there was now enough activity in Delaware to revitalize the old Delaware Radio Club. We sent out a mailing to all licensed Amateurs in Delaware County and you know what happened next. They came out of the woodwork! At that time most of the clubs in Central Ohio were ‘repeater’ clubs except for CARA, but it was a long drive to COSI (where they met) on a working night. That’s why it was decided that it was time for a ‘General Interest’ radio club in Delaware. DELARA began participating in annual Field Day activities and we always had quite a few CW gurus. When Paul Forgrave, K8ES passed away we asked the family if we could obtain his call sign for the Club, and they agreed. Well, how do you make more CW contacts in 24 hours? Get a shorter call sign! Hence the current call. Over the years DELARA members have always felt it was important to give back to the community, so we held radio classes, participated with the local Red Cross and other agencies, parade organizers, etc. which qualified us as a Special Service Club. If you haven’t seen the first 25 years worth of DELARA News, it is still available on a CD. It’s well worth the reading when you get bored on a cold Winter night. Contact me if you are interested in reading the “whole story”. What is Ham Radio? Amateur Radio has been around since the 1930’s - and has been on the innovative edge of communications technology ever since. Like your cellphone? Back before cells in the 70’s, hams were walking around making phone calls through their handheld transceivers using two meter repeater systems. In the 90’s they were using the same operating systems only talking to satellites dedicated to ham radio. Today, they’re Internet linking a local repeater with a repeater in, say, London and talking like they were standing in front of the Hard Rock. 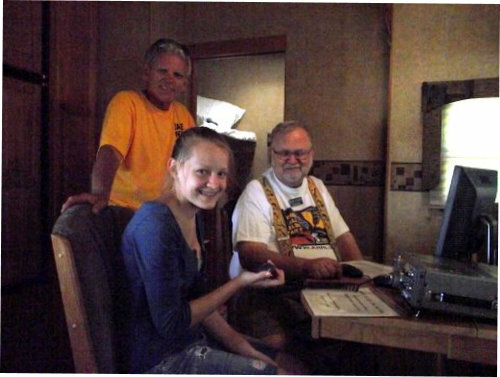 For years, Amateur Radio has been at the forefront of public service. Starting in the 60’s, the Hurricane Watch Net and the Maritime Mobile Net and others helped people at sea, people in the path of hurricanes to stay connected with the world. Hams have trained with the National Weather Service to protect their own communities by spotting for severe weather and tornados. In between, hams make friends around town, around the country, and around the world. It’s an interesting hobby for several reasons. It’s easy to get started, but you need to pass a test to obtain a FCC license to operate. No, you don’t have to know Morse Code. Once licensed, there is a wide variety of aspects to the hobby- from ‘old fashioned’ Morse Code (still the most dependable means of communication in tough conditions) to computer generated digital communication. Hams have several dedicated satellites in the sky, and when they aren’t enough, hams just bounce a signal off the moon. It is a hobby that can last a lifetime. 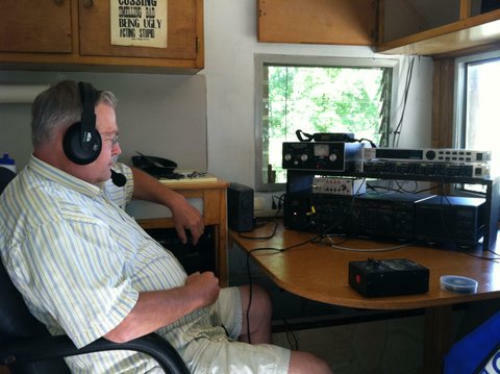 One of the best aspects is that ham radio is an equalizer. A number of very impressive people have licenses- and perhaps only on ham radio, their conversations are just like anyone else’s. Handicapped? No problem- and the conversation you have, the technical knowledge you possess, and the ability to reach out to other people is completely independent of your physical limitations.